I have reviewed one of Jerry Murland’s 1940 books here previously, and it is good to see that he is writing some more on the often neglected 1940 campaign in France and Flanders. This latest title from Pen & Sword books is in the Battleground Europe series of battlefield guidebooks and looks at the fighting on the Escaut Canal area in May 1940. 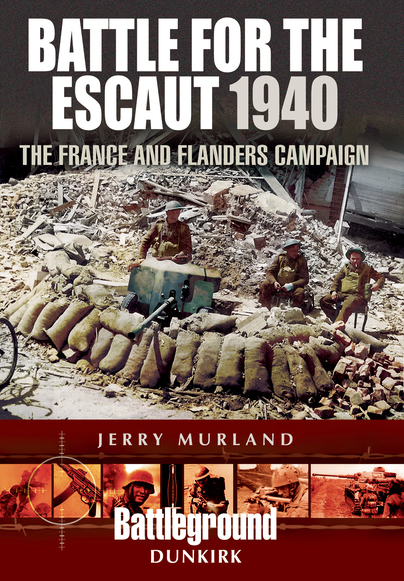 The book looks at the background to the 1940 Campaign and then follows the three British Army Corps that defended the Escaut area, from near Menin to south of Tournai in Belgium, examining the various units and actions in some depth, with some great source material – something I have come to expect from Jerry Murland. The next part of the book follows a number of battlefield tours and takes you by car or a number of walks around the key areas of the battlefield. This section is extremely useful and hopefully will encourage people to visit some of the neglected 1940 battlefields. The Battle for the Escaut 1940 provides both excellent history, and is a superb guidebook to some of the important battlefields of the 1940 campaign. Highly recommended. The book is available from the Pen & Sword website.